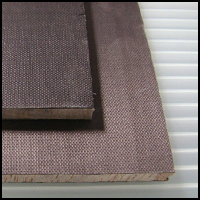 Carbon Sandwich Panels - CST The Composites Store, Inc. 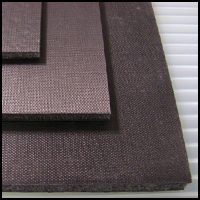 Carbon fiber sandwich panels have a core of Rohacell foam with bidirectonal carbon fiber on both outer surfaces. 0.118" Rohacell 71 Core with 0.010" Carbon Fiber, Sandwich Panel, 5.75" x 5.75"
0.118" Rohacell 71 Core with 0.030" Carbon Fiber, Sandwich Panel, 5.75" x 5.75"
0.118" Rohacell 71 Core with 0.030" Carbon Fiber, Sandwich Panel, 5.75" x 11.75"
0.118" Rohacell 71 Core with 0.030" Carbon Fiber, Sandwich Panel, 11.75" x 11.75"
0.118" Rohacell 71 Core with 0.030" Carbon Fiber, Sandwich Panel, 11.75" x 23.75"
0.118" Rohacell 71 Core with 0.030" Carbon Fiber, Sandwich Panel, 12" x 48"
0.25" Rohacell 71 Core with 0.010" Carbon Fiber, Sandwich Panel, 5.75" x 5.75"
0.25" Rohacell 71 Core with 0.010" Carbon Fiber, Sandwich Panel, 5.75" x 11.75"
0.25" Rohacell 71 Core with 0.030" Carbon Fiber, Sandwich Panel, 5.75" x 5.75"
0.25" Rohacell 71 Core with 0.030" Carbon Fiber, Sandwich Panel, 5.75" x 11.75"
0.25" Rohacell 71 Core with 0.030" Carbon Fiber, Sandwich Panel, 11.75" x 11.75"
0.25" Rohacell 71 Core with 0.030" Carbon Fiber, Sandwich Panel, 12" x 48"
0.50" Rohacell 71 Core with 0.030" Carbon Fiber, Sandwich Panel, 5.75" x 5.75"
0.50" Rohacell 71 Core with 0.030" Carbon Fiber, Sandwich Panel, 5.75" x 11.75"
0.50" Rohacell 71 Core with 0.030" Carbon Fiber, Sandwich Panel, 11.75" x 11.75"
Carbon fiber sandwich panels have a core of Balsa with bidirectonal carbon fiber on both outer surfaces. 0.25" Balsa Core with 0.010" Carbon Fiber, Sandwich Panel, 0.010" Carbon Fiber, 5.75" x 5.75"
0.25" Balsa Core with 0.010" Carbon Fiber, Sandwich Panel, 0.010" Carbon Fiber, 5.75" x 11.75"